There's a glut of titles Marvel has coming up in the next few months, and two of those arrive in the shadow of mystery left by Avengers: Endgame. We know so little about it that anything we see from Spider-Man: Far From Home feels like a spoiler. The same could be said for the first film to arrive, Captain Marvel, except the smart decision was made to have it be a prequel set more than two decades earlier. Marvel hasn't gone this route since Captain America's first movie way back in Phase One. 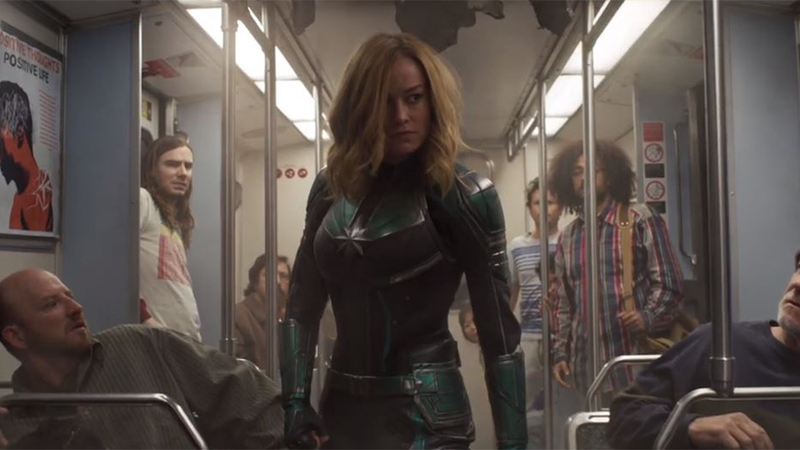 Brie Larson has revealed the first clip from Captain Marvel, and it looks to be an extension of the notorious scene in which she punches an old lady on a subway. Of course, that lady turns out to be one of the alien shapeshifting Skrulls who are invading Earth. So that makes it perfectly okay. We also get to see young Nick Fury and Phil Coulson, following behind them like something out of Dragnet. In addition, a new Super Bowl spot has landed, just as we expected, ahead of the film's debut on March 8th.